Spring steels, such as the stainless spring steel employed in Bigfoot gun belts, are formulated and tempered so the metal will bend while in use, without breaking, and once pressure is released, return to its original shape. Strengthened by a spring steel core, a Bigfoot belt provides the maximum vertical and horizontal hold once in place, but doesn’t ever take a permanent crimp. This is a sturdy gun belt that will fit securely and comfortably for a lifetime. English Bridle Leather is a type of full-grain leather, the highest quality leather there is. Full-grain leathers are the top-most layers of hide, making them quite strong, yet supple. Bridle leathers are made by treating full-grain leather with natural tannins, oils and preservatives, rendering a matte-like finish and subtle texture. The result is a piece of leather that will break in overtime but never lose strength. 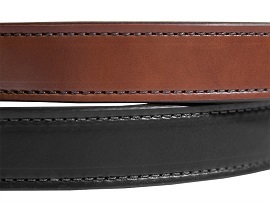 Our belts are drum-dyed for uniform color, with the result being the best leather gun belt that will work for a lifetime with any clothing ensemble. If you work with tough leather, you should use a thread to match. Tex 270 is a heavy-duty bonded nylon thread that, like bridle leather, is heavy-duty and high-quality. This type of thread is usually reserved for industrial or other heavy applications; common goods with Tex 270 thread are upholstery, boat covers, horse tack and the like. Unlike other belts that employ cheap stitching, we build Bigfoot belts to last a lifetime, without the fraying that occurs in less-rugged gun belts. Ever notice rust or pitting on a gun belt that you’ve had for some time? That’s due to cheap hardware. We use steel roller buckles, available in flat black or standard steel colors, in order to ensure a lifetime of function and durability. The roller buckle allows you to smoothly insert the gun belt when putting it on. To anchor the belt buckle, we employ heavy-duty directional snap fasteners, which hold more strongly than universal snaps, with the idea being that once this gun belt is put together, it won’t be easily undone. A gun belt like this can’t just be sewn together and shipped - it demands presentation. To that end, Bigfoot’s craftsmen painstakingly finish the edges when the belt is stitched together. The edges are beveled, and the top is burnished, which softens the belt’s edges. Then, the edges are painted along the entire edge of the belt, giving it a uniform appearance. You’ll barely notice the seam along the dual layers of leather. If the goal is to make a strong leather gun belt that will carry any handgun securely and look good doing so, you can’t skimp on the leather. Ever notice how department store belts look smooth on one side and rough on the other? That’s because they use only one strip of hide. That’s also why you have to buy a new one fairly often. Dual layers of leather provide strength for a lifetime of wear, but the smooth surface makes guiding through belt loops a breeze. It also makes for one seriously good looking leather gun belt.